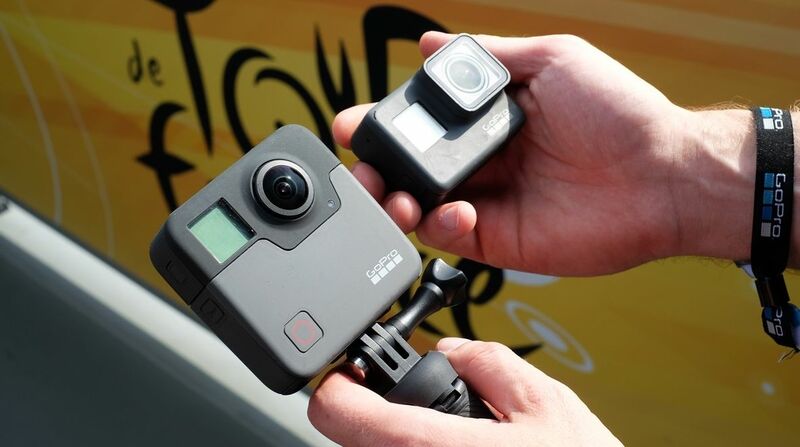 Along with the new GoPro Hero6 Black, the company has given us a look at the finalized GoPro Fusion, is a 360-degree, spherical action camera that can capture stills and footage for VR as well as video and images. GoPro teased us with the Fusion earlier this year, with GoPro's CEO Nick Woodman calling it "six GoPros fused into one", and now it's revealed all. The Fusion has two lenses, stitching together two wide-angle captures for full 360-degree capture. It shoots up to 5.2K video as 30fps, while also capturing 360-degree sound and takes 18-megapixel spherical stills. But it's new OverCapture software that makes Fusion so interesting. You can film everything when you're out, then come home and "punch out" select HD images and angles from the hi-res, 360-degree video, letting you feel like a directing pro. Or you can just make some of those "tiny planet" videos, creating tiny spheres from your 360 footage. Of course, all of your 360 videos should look pretty amazing when played back on your VR headset. The Fusion is waterproof to 5 meters and comes with all the the usual: GPS, Bluetooth, Wi-Fi, accelerometer, gyroscope. GoPro says it's compatible with "most" mounts too. While the Hero6 is now available, you'll have to wait a little longer and pay a bit more for Fusion, which ships this November for $699. This type of camera can range from just-about-affordable to cost-of-a-house-deposit ($30,000 or up to $60,000), so GoPro's offering here is reasonable.